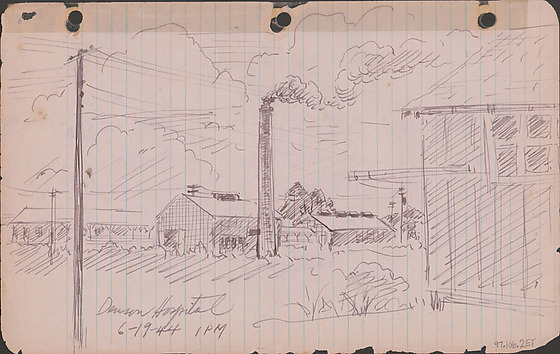 Ink sketch of Denson hospital in Denson, Arkansas, June 19, 1944, 1 PM. Partial view of a building in foreground right ; utility pole foreground left. In distance, two large buildings with vents on roof next to low buildings with verandas. A large smokestack stands at center billowing smoke to the right. Large clouds above. Drawing 97.106.2ES on verso of same sheet. Written in black ink, bottom left: Denson Hospital / 6-19-44 1PM.